The nail that Martin Luther used to affix his ninety-five theses to All Saints’ Church in Wittenberg Germany on October 31, 1517 was also the first nail in the coffin of the Christian celebration of Halloween. Because veneration of the saints was considered to be a heresy by Luther, his followers dismissed the celebration of the Feast of All Saints and its Vigil (literally All Hallows Evening from which we derive the anglicized Halloween) as superstition and Halloween became a day of mockery in Protestant countries. This has led to an almost total Paganization of this holiday and has caused many Catholics to throw up the white flag, abandoning any hope that this once-great Christian feast can be restored to its full meaning. From the outset, it is helpful to trace the origins of the celebration of Halloween because it is of mixed—both Pagan and Christian–origins. Because the number of martyrs was so great during the first five hundred years of Christianity, the faithful found it nearly impossible to commemorate even the most significant of them throughout the year. So a movement for a common feast of all martyrs arose. The feast was celebrated in various places and at various times until Gregory III (731-741) finally celebrated a Feast of All Saints on November 1 in St. Peter’s in Rome. Shortly after that Gregory IV (827-844) extended the feast to the entire Church, to be celebrated on November 1. Meanwhile, the ancient Celtic people celebrated their New Year on what would be November 1st on our calendar. On their New Year’s Eve (October 31) they believed that the lord of death, Samhain, allowed the spirits of the dead to return to their homes. At the same time, evil spirits also were free to roam around and it was believed that they would leave you alone if you dressed like one of them. They also prepared a great feast to mark the end of the harvest time. Eventually Christianity spread into the Celtic region. But celebrating their feasts, even if only seen by them as cultural artifacts, was still important to them. As the Church has done throughout the Centuries, she baptized the Celtic feast by giving the practices a Christian meaning. The Celtic festival was a celebration marking the end of harvest time and was a time in which they celebrated the dead. The Christians too had a way to celebrate the lives of the dead and marking the harvest of souls which they called All Saints day. It was natural then that the two feasts be “combined” and thus was called Halloween. Obviously not all of the elements of the original pagan festivals can be redeemed and incorporated into the Christian celebration. Elements like human sacrifice to the gods or dressing up like evil spirits and witches to placate had to be removed completely. The Church replaced them with what was true. Like all festivals, it centered on the one true Sacrifice, the Sacrifice of the Mass. The pagans believed that the souls that entered the nether world bore great hunger and would beg for food. From this came the practice of dressing up like the dead and begging for treats. As the holiday was Christianized, poor children would visit the houses of wealthier neighbors and receive pastries called soul cakes in exchange for a promise to pray for the dead members of the patron’s family. The Church also introduced the Feast of All Souls to replace the practice of recalling the dead. Once Henry VIII suppressed the Church in England, some of the original pagan practices were able to creep back in. This is the form of Halloween which was brought to the United States and has led to an unquestioned acceptance of all the previous pagan practices. Like Christmas, Halloween has become so ingrained in our national culture that most people accept it without understanding the meanings behind the practices. In response, many Catholics avoid celebrating Halloween completely. 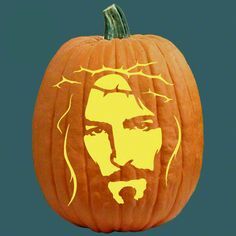 The problem with this is that Halloween is a Christian celebration and, rather than abandoning it to the whims of a floundering culture, it needs to be restored by Catholics. But how can we do that? If you have made it this far in the essay, the first will be easy. Learn about the true history of Halloween and preach it. 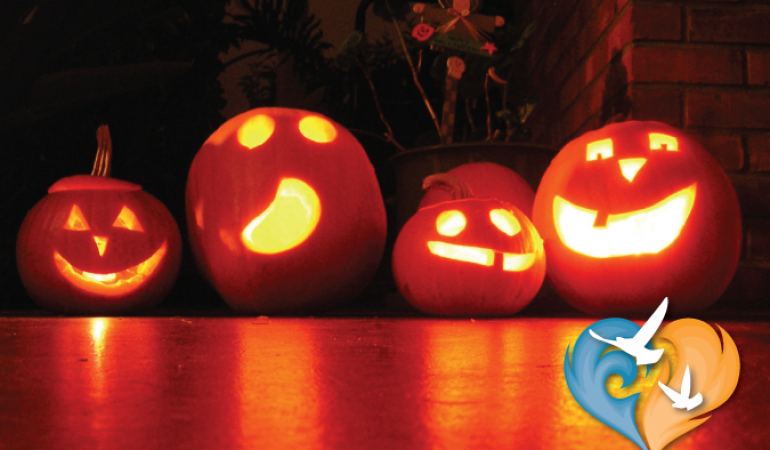 Halloween is not dark and scary but a celebration of Christian hope. 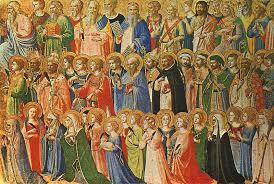 The saints we celebrate have won the race and now serve as a great cloudof witnesses spurring the rest of us on. These saints are not dead, but alive and waiting for us to know them and call upon them for help. Halloween is richer when we know the saints and tell others about their lives. What about trick or treating and costumes? There is no reason why, when done intentionally, these need to be avoided. It is a good idea to avoid the “trick or treat” dialogue and instead reinstitute the practice of praying for the dead family members of the homes you visit in exchange for candy. 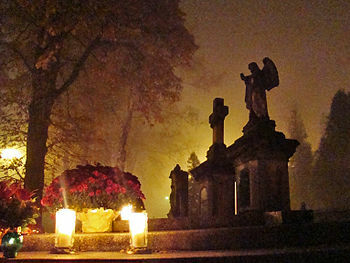 Praying for the dead is a spiritual work of mercy and therefore trick or treating can be an occasion of grace; the very reason the festival was celebrated to begin with. By starting the flow of grace into the celebration, this simple act can go a long way in restoring Halloween to its proper place. If children are bold enough to ask their patron if they want them to pray for anyone in their family then that is great. But for those who may be uncomfortable a silent prayer at each doorstep is sufficient. It is a great opportunity to teach them the habit of praying for the dead and we do not want it to be something unpleasant or embarrassing. Recalling that the practice of dressing up as witches, goblins and devils all have pagan roots, costumes of this nature should be avoided. Dressing up as a saint offers an opportunity not only to honor a saint, but to answer the inevitable “who are you supposed to be?” questions. Costumes of martyrs should be preferred, especially for young men. There is nothing objectionable in choosing superhero costumes or cartoon characters as long as the characters themselves do nothing objectionable, but there is always the risk that the meaning of Halloween will be lost. In a culture that is decidedly not Christian, we can neither go with the flow nor create Catholic ghettos. It is a culture in need of redemption. We have to be not only festive, but intentionally draw out the true meanings of the holidays. In this regard, Halloween is no different. It may be succumbing to the gravity of paganism, but the final nail has yet to be driven into its coffin. Catholics must claim it as their own and reveal its true meaning. This was a great article; addressing ideas ( being a convert ) I had never really thought about. Because, in my experience and that of my kids, it was all about the candy and that’s all. Trick or treating, getting as much candy as we could, then arranging ,organizing and trading it with each other. I’ve always felt badly for kids that were not allowed to participate in the trick or treating, because I imagined for them it was just about the candy and they really couldn’t understand why they couldn’t participate. These are great ideas! Thank you !